Across vast prairies, the towering Rockies, and through the Columbia River Gorge traveled thousands of settlers for the chance to claim a small piece of land in the Willamette Valley. As the sky began to glow at sunrise I stood in awe of my environment. Surrounded by tulips of every hue, from the delicate whites swaying in the lightest breeze to the deep reds in the distance, I suddenly knew why so many braved the ‘Oregon Trail’ to settle in this beautiful valley. With Mt Hood just a whisper on the horizon, I carefully found the perfect composition. 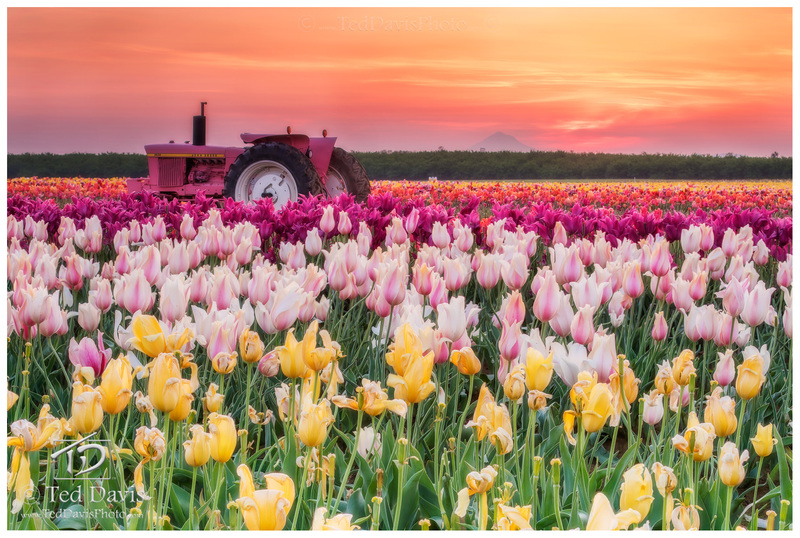 Shot after shot, focusing first on the yellows, pinks and purple tulips before capturing the beautifully painted tractor, and finishing with Mt Hood in focus, I knew it would be some work to stack these images to make one seamless capture – focused from the smallest flower, to the mountain in the distance. Photo © copyright by Ted Davis.